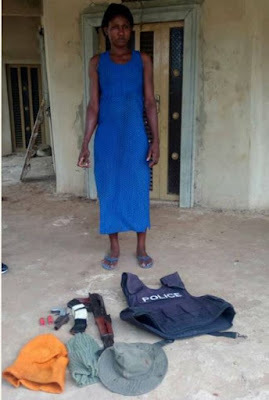 A woman identified as Osioma Paul, the wife to a kidnapper now in prison and sister in law to an arrested gang leader, Ifeanyi Stanley - was arrested for keeping the operational rifles and rmmunition for kidnappers in her house in Abia state. Exhibits recovered are: 0ne AK47 Rifle with S/no 56-2550382 with 2 Magazines and 60 live Ammunitions, One Barretta Service Pistol of the Mopol Unit Commander, One local made Pistol and 2 Catridges, One Police Bullet proof jacket, One Police vest, 2 head Warmers, One Mopol Jungle Cap. 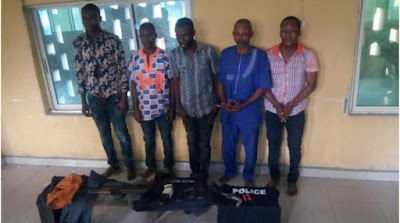 (3) Kidnap operations in Abia State. John Alozie 'm' aka Alagboso 26yrs. Native of Osisioma, Abia State. Confessed to the Unit commander kidnap and 2 other Kidnappings. Ogbonna Wesley 'm' 31yrs. 4.) Eze Obinna 'm' 22yrs. native of Isiala Ngwa, Abia State. Unit commander - kidnap and used victim’s ATM card to withdraw money frm Victims account. Eze Orji 'm' 58yrs. Native of Isiala Ngwa, Abia State.